Posted on August 20, 2015 by Sean K.
Monarch butterflies arrived in the middle of July and taken up residence in the meadow at the Museum of American Bird Art. So far, I’ve counted 4 adults in the meadow at once, with one or two butterflies present on most days. 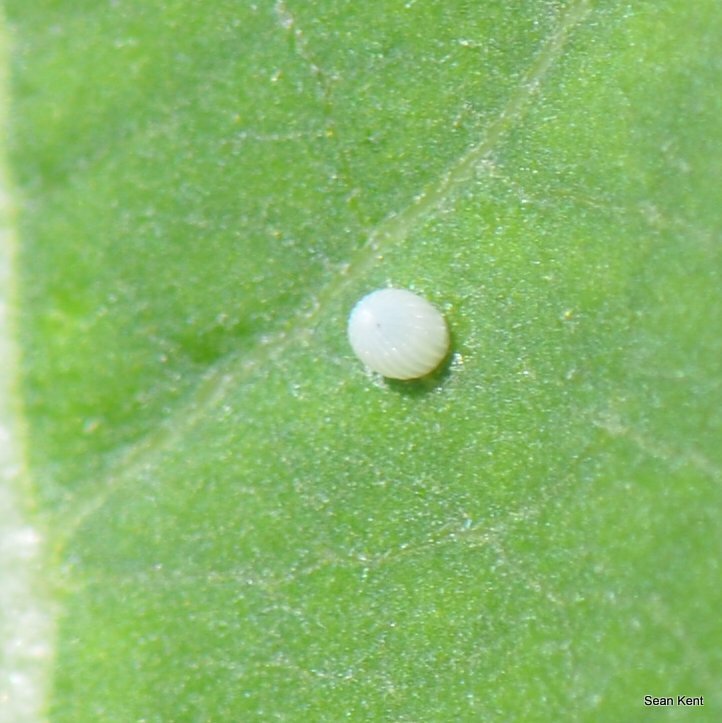 They have been laying lots of eggs on common milkweed (Asclepias syriaca) and these have been hatching over the past two weeks. I’ve counted around 20 or so eggs and found 6 caterpillars munching away on milkweed. Monarch caterpillars only eat plants in the milkweed genus (Asclepias) and common milkweed is by far their most important host plant. 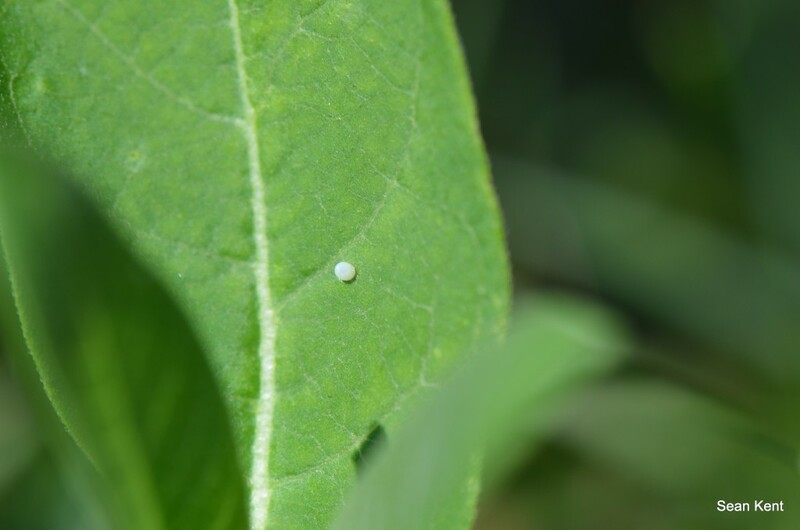 Approximately 90% of migrating North American monarchs eat common milkweed as caterpillars. I will post updates on monarchs periodically, but wanted to share photos and time lapse videos about the monarchs at MABA. Further, some background information about their migration and conservation can be found at end of this post, including two tremendous Mass Audubon resources. Look at the beautiful sculpturing that is present on this teeny tiny egg. Once the caterpillars hatch, voracious consumption of milkweed ensures. Check out these time lapse videos. In North America, monarch butterfly populations have dramatically declined over the past 20 years, with the population hitting their lowest total ever in the winter 2013-2014. However, Chip Taylor, professor at University of Kansas and founder of Monarch Watch, is guardedly optimistic about this years monarch population. Where do Monarch Butterflies Spend the Winter? The majority of North American Monarch Butterflies spend the winter in the pine and oyamel trees located at the Monarch Butterfly Biosphere Reserve on the border of Michoacan and Mexico State, Mexico. Monarch butterflies in the Pacific Northwest typically overwinter in trees along the California Coast and there is some evidence that Monarch Butterflies in the Northeastern United States also overwinter in Cuba in addition to Mexico. Check out this fantastic video by MonarchWatch.org of the forests in Mexico where monarchs will spend the winter before migrating back North. – Check out this map of 2015 monarch butterfly and caterpillar sightings. Here are MABA, I report our sightings to this organization to be part of this national citizen science project. Email me, skent@massaudubon.org, if you’d like more information. This entry was posted in Natural History, News, Pollinators, Wildlife Sanctuary and tagged Asclepias, Asclepias syriaca, Canton, Common Milkweed, Egg laying, Host Plant, Joe Pye Weed, Mass Audubon, Migration, milkweed, monarch butterfly, Monarch butterfly population status, Monarch Caterpillar, Museum of American Bird Art, Natural History, Time Lapse Video on August 20, 2015 by Sean K..